'Little Yarn Dolls: Method 2' is worked 'flat & seamed' on 2 knitting needles. This 16 page PDF pattern contains lots of photographs, written instructions, links and tips to help you along the way. Two leg styles are included - choose from either ankle socks or stripy tights both with Mary Jane Shoes. Hair is quick and easy to apply and hat is sewn in place. Frilly dolly skirt is removable. This listing is for the KNITTING PATTERN only. This pattern is for your personal use only. 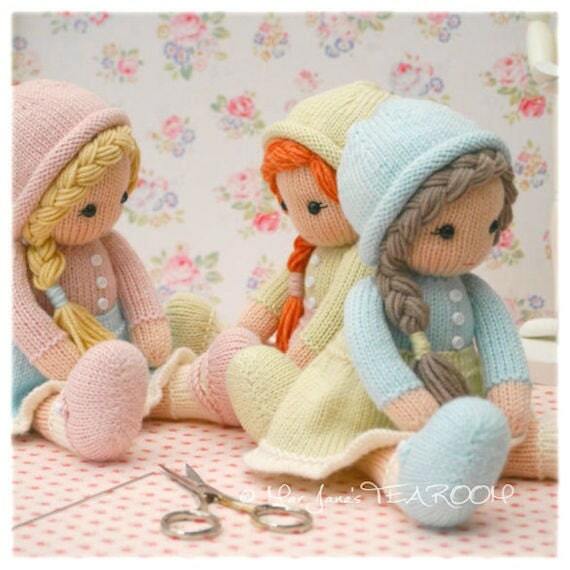 The little dolls are so cute can't wait to get started on making them. Beautiful pattern, can't wait to start it. Loads of pictures to help along the way. Excellent customer service sending a thank you email and complementary pdf of the same pattern knitted "in the round". Many thanks and would definitely buy from you again. Such a lovely doll. Had a quick peek at the description and it looks very clear to me.